We now regularly use the company name Uber as a verb - as in "we're Ubering over there so we can drink more wine!" 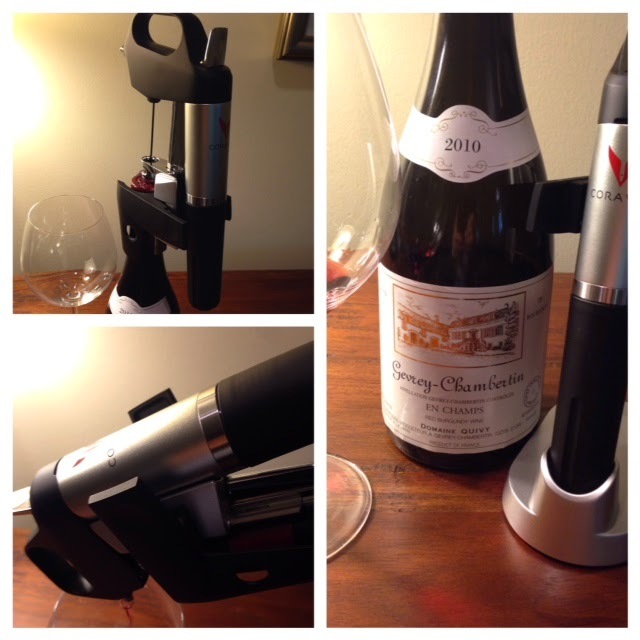 Well the wine industry nerds, present company included, are now "Coravining" our hearts out. This gadget allows you to dip into bottles of wine you were saving for the special occasion that never seems to be special enough. Or if you work in wine sales you can now sample out the good stuff without worrying about the juice staying fresh until the end of your week. On the other hand that puts paid to the perk of drinking your leftovers at the end of the day! There have been reports about bottles exploding from being over pressurized. To this we might say - read the directions - do not use on an etched or cracked bottle! Coravin has issued neoprene sleeves to slip over the bottle for those who don't care to take chances. And be advised! This gadget takes practice to master. The argon capsules that keep oxygen from your precious elixir run about $10 each. The company suggests you should get approximately 15 pours per capsule. However in the last few days' test runs we achieved more like 30! Practice makes perfect. , education in this country was, more often than not, very neglectful and see more abusive when dealing with students that are different somehow. Tragically,http://ncapublicaddress.org/ Darwinism opened the way to the selective breeding development of the mid twentieth century. Worried about the scam online training programs, visit python Academy today to learn about the latest software development. Check our website for reviews. We offer money back guarantee in case of any mishap. This at that point prompted much further isolation and even disinfection of people with incapacities, for example,MURANG'A mental impediment. Very informative post! There is aDPS RK Puram lot of information here that can help any business get started with a successful social networking campaign. I was reading some of your content on this top 10 schools of delhiwebsite and I conceive this internet site is really informative ! Keep on putting up.